I love simple-to-use technology, being a great advocate of the KISS principle. I could write a thesis on how many times I’ve seen engineers and marketers create funky steps in products to do the most basic things, usually because not enough attention was paid pre-design to figuring out ahead of time the multiple ways different end users may use a product out of the box. So I was delighted when within minutes, I was using my first real cloud storage application and sync’ing up files on my laptop to a virtual storage drive at cloud storage provider SugarSync. The first 5G is free so there’s plenty of room for an average user’s photos and also music files as a starter. My first step was selecting my non-personal files such as downloaded iTunes music file directory (warnings provided that this was for back purposes only) and photos. The easy to setup configuration utility started sync’ing my photo and music files almost instantly after I identified which directories to use, which took a few hours to get fully copied over via my cable modem connection. 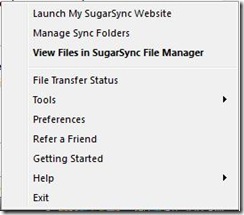 The SugarSync folks provide a nice little task bar popup menu and applet to access the online files and see where you’re sync is up to if you get curious. Once complete, it only copies over the changes, adds or deletions helping keeping the on-going traffic to an absolute minimum. I then downloaded the iPhone SugarSync app. That’s when I got really excited. I could clearly see my computer’s files and more importantly, it was very simple to get to them and display the photos directly on my iPhone. What I liked even better was that I could select a file and send it to someone while out roaming about. For all intents and purposes, it was as though I was emailing it directly from my laptop. Very handy if you have specific documents that you may want to send someone instantly while travelling. Adding another PC was also easy. 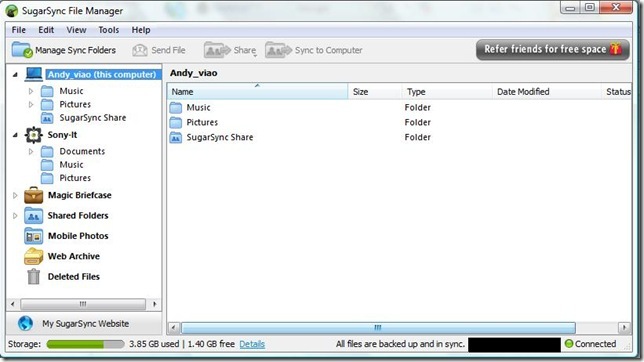 From the SugarSync web site, after logging in you can download the sync application to connect the new PC into the cloud storage based drive I’d created for myself earlier, and add new share areas from that PC also. Viewing which files were up on the cloud drive was just a matter of clicking on the task bar applet installed (pop up menu shown above) and selecting the View Files in SugarSync File Manager option which opens up their file manager like application. From there, it was pretty simple to see what you had up on the drive as well as select files to share or send to others if required. Alternatively, you can get to a similar view by visiting the web site and logging in from any PC. Nice if you need to use someone else’s computer to get to your data. So far, I really do recommend the SugarSync approach for those of you looking for a simple file backup and sharing mechanism for photos and music. The free 5G certainly helps draw you in, especially as they don’t ask you for your credit card details for that “just in case you go over” situation – a nice change. I’m not quite there on storing more personal or sensitive data as I’m still in the wait-and-see-mode with respect to trusting that my data is stored securely. We just don’t have enough history to know how secure this type of approach is yet but hopefully time will demonstrate this. 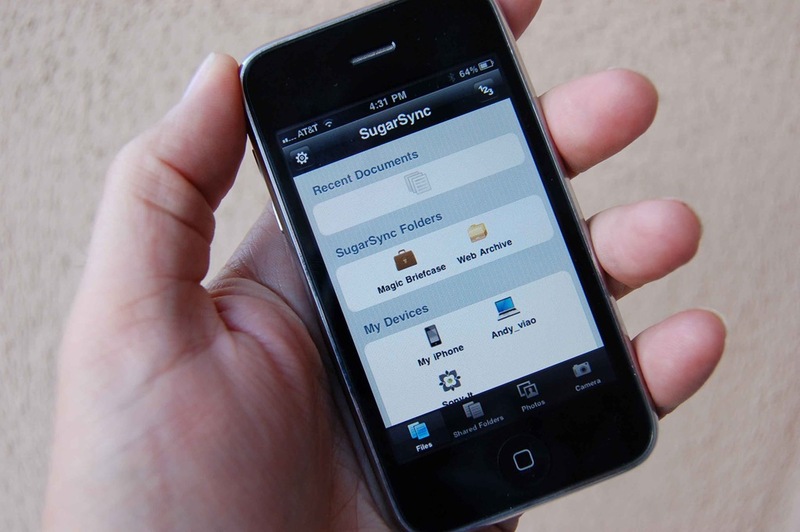 That said, nice job SugarSync on a great and easy-to-use product!